Charles-André "Chuck" Comeau MSC (born 17 September 1979) is a Canadian musician and drummer, best known for being the drummer of the rock band Simple Plan. He also founded the apparel company Role Model Clothing along with his bandmate Pierre Bouvier and the band's best friend, Patrick Langlois. He is also former drummer for the punk rock band Reset from 1993 to 1999, which he quit to form Simple Plan with his Reset bandmate who also left Reset, Pierre Bouvier. The Meritorious Service Cross is a decoration that is, within the Canadian system of honours, one of the two Meritorious Service Decorations gifted by the Canadian monarch, his or her Governor-in-Council. Created in 1984, the medal is intended to recognize individuals—both Canadian and foreign—who have carried out meritorious acts bringing benefit and honour in either of two categories: military and civilian. Simple Plan is a Canadian rock band from Montreal, Quebec. The band has released five studio albums: No Pads, No Helmets...Just Balls (2002), Still Not Getting Any... (2004), Simple Plan (2008), Get Your Heart On! (2011), and Taking One for the Team (2016). The band has also released an EP titled Get Your Heart On – The Second Coming! (2013), in addition to two live albums: Live in Japan 2002 (2003) and MTV Hard Rock Live (2005). Pierre Charles Bouvier is a Canadian singer, songwriter, musician, composer and actor who is best known as the lead vocalist of the rock band Simple Plan. Gaétan-Jean Sébastien Lefebvre Pépin is a Canadian musician, who is best known as the rhythm guitarist and backing vocalist for the rock band Simple Plan. He has also released solo albums and duo work. Comeau start his music career in 1993, when he was 13 years old along with bandmate Pierre Bouvier. Comeau left Reset in 1998 to study law on McGill University, and left to pursue music career, he later reunited with Bouvier at a Sugar Ray concert, they later formed Simple Plan in 1999 along with old schoolmates Sébastien Lefebvre and Jeff Stinco. Later, David Desrosiers replaced Bouvier and Reset but only last for 6 months and left Reset to join Simple Plan. Sugar Ray is an American rock band from Newport Beach, California. Originally forming in 1986 and playing heavier nu metal styled music, the band achieved mainstream popularity in 1997 with their more pop influenced single, "Fly". The song's success of which led the band to shift its style dramatically to the more radio-friendly pop sound with their subsequent releases. Their best-selling album, 14:59, was released in 1999, and featured popular singles "Every Morning", "Someday", followed by a self-titled album in 2001 featuring the single "When It's Over". The band would release two further albums, In the Pursuit of Leisure (2003) and Music for Cougars (2009), though the albums and respective singles generally sold far less. The band would continue to tour into the 2010s, though as of 2019, no further albums would be released by the band. Comeau has released all albums with Simple Plan: No Pads, No Helmets...Just Balls (2002), Still, Not Getting Any (2004), Simple Plan (2008), Get Your Heart On! (2011) and Taking One for the Team (2016). Simple Plan has released 2 EPs: Live in Anaheim (2004) and Get Your Heart On – The Second Coming! (2013). Simple Plan has released 2 live albums: Live in Japan 2002 (2003) and MTV Hard Rock Live (2005). Simple Plan has also released a video album which Comeau directs it, titled A Big Package for You (2002). No Pads, No Helmets...Just Balls is the debut studio album by Canadian rock band Simple Plan. 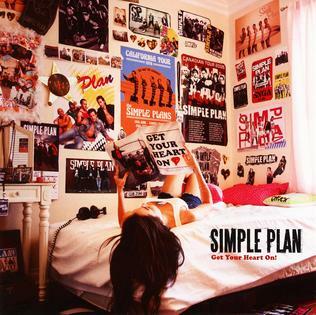 Still Not Getting Any... is the second studio album by Canadian rock band Simple Plan. It was released on October 26, 2004 by Lava Records. The album garnered a positive reception, but critics were unsure of the band's musicianship and lyricism in their given genre. Still Not Getting Any... debuted at number 3 on the US Billboard 200 and spawned four singles: "Welcome to My Life", "Shut Up! ", "Untitled " and "Crazy". It was certified Platinum by the Recording Industry Association of America (RIAA), denoting sales of over one million copies. 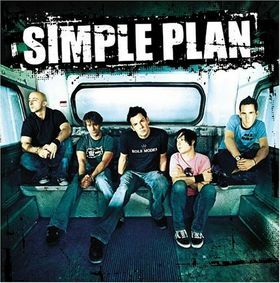 Simple Plan is the self-titled third studio album by Canadian rock band Simple Plan, released on February 12, 2008. The album was a large musical departure from the band's previous albums, as its theme was more love-based than teen angst. It reached No. 2 on the Canadian album charts, No. 14 on the US Billboard 200 and charted in the top 10 worldwide in countries including Australia, Austria, Brazil, Sweden and Switzerland. Get Your Heart On! is the fourth studio album by Canadian rock band Simple Plan, released on 21 June 2011. In some countries such as Australia and the Netherlands, the album was released on 17 June 2011. "Can't Keep My Hands off You" was released as the first single on 31 March 2011. "Jet Lag" was released as the record's lead single on 25 April 2011 and several music videos were released. On 4 May 2011 the English version was released and on 16 May 2011, the French version was released. On 27 December 2011, Chinese singer Kelly-Cha collaborated with Simple Plan to create a Chinese version of the song. Two days after, an Indonesian version was made featuring collaborations from Kotak lead vocalist Tantri. The third single "Astronaut" was released on 19 September 2011 with the music video premiering the same day. "Summer Paradise" was released as the album's fourth official single on 13 December in Australia, then worldwide on 28 February 2012, with a music video shot entirely in Australia on their Get Your Heart On! Tour. On 26 March 2013, an official music video for "This Song Saved My Life" was released on YouTube. In 2017, when Simple Plan's debut album celebrated its 15th anniversary, the band brought back two "old-school designs" of Role Model Clothing, which were available for a limited time in their merch stand. Comeau directed and starred in Simple Plan's video album A Big Package for You (2002). He currently uses DW drums, pedals and hardware, Evans Drumheads and Zildjian cymbals. His kit configures of two floor toms, one rack tom, a bass drum, and a snare drum. "Untitled " is a song by Canadian rock band Simple Plan. It was released in April 2005 as the third single from their second studio album, Still Not Getting Any.... The song's official title, when the CD was released, was simply "Untitled".The song grew in popularity after several memes were posted online. "Perfect" is the fourth and final single taken from Simple Plan's debut album, No Pads, No Helmets...Just Balls. Reset is a punk rock band formed in 1993 in Montreal, Quebec, Canada. No Limits is the second studio album by Canadian punk rock band Reset. It was released in 1999, and re-released in 2006. Faber Drive is a four-piece Canadian pop punk band from Mission, British Columbia, formed in 2004. The band currently consist lead vocalist Dave Faber, lead guitarist Jordan Pritchett, bass guitarist Jeremy "Krikit" Liddle and drummer Seamus O'Neill. "Your Love Is A Lie" is the second single by Canadian rock band Simple Plan from their self-titled third studio album. "Save You" is the third and last single from Simple Plan's self titled album. It was announced as the third single in a message to "SP Crew", the band's official members-only club. "Summer Paradise" is a song by Canadian rock band Simple Plan, featuring Somali-Canadian rapper K'Naan and Jamaican reggae artist Sean Paul. It was released on December 13, 2011 in Australia as the third official single from their fourth studio album, Get Your Heart On! (2011). It was written by Emanuel Kiriakou, Keinan Warsame and the band and produced by Brian Howes. The song is a reggae and ska punk-based track and it was inspired by the band vocalist's hobby of surfing. It was released in Australia with an accompanying music video with shots of the "Get Your Heart On Tour!" and scenes of the band in Barbados and on the beach. The track was released in the United Kingdom as the lead single. Oliver Scott "Oli" Sykes is an English musician, singer, songwriter, entrepreneur and clothing designer, best known as the lead vocalist of the rock band Bring Me the Horizon. He also founded the apparel company Drop Dead Clothing. Sykes has also created the graphic novel Raised by Raptors with Drop Dead Clothing artist Ben Ashton-Bell. Get Your Heart On – The Second Coming! is an EP by Canadian rock band Simple Plan, composed primarily of b-sides from Get Your Heart On!. It was released on 29 November 2013 in Australia and on 3 December 2013 worldwide except for Japan, which was released 29 January 2014. "Singing in the Rain" is a song by Canadian rock band Simple Plan from their fifth studio album, Taking One for the Team (2016). On the album, American musical duo Rock City are featured on the track, with an additional verse written by the duo's Timothy and Theron Thomas, however the single version does not include this feature. The solo Simple Plan version of "Singing in the Rain" was released to digital retailers on March 25, 2016 as the album's third official single. "History" is the first single from Canadian band Story Untold. The members of Story Untold are from Quebec, Canada, which is also home to Simple Plan. Simple Plan has known the five-piece for a while, and the French Canadians teamed up to write Story Untold's newest single "History". The song is about how the band is going to make it big, even if it seems like a crazy idea: "You can call me crazy/But when I close my eyes/I can see it clearly/I can see the shining lights." The song was co-penned with Simple Plan's vocalist Pierre Bouvier and drummer Chuck Comeau. The song is just one of seven songs on the band's self-titled EP. History also has a music video where the band is a part of an underground fight club. It features each boy taking on a different fighter, and it subtly introduces each band member for those who have never heard of Story Untold before. An acoustic version of the song does appear on YouTube but is not featured on the Story Untold EP. Waves is the debut album by Canadian rock band Story Untold. The third full-length studio album Janick Thibault has released since his formation of Story Untold. This is the first album to be released on Hopeless Records from the band. This is also the first album to feature drummer, Jonathan Landry. The song "Delete" and "Drown in My Mind" were released from the album. As of May 2018, this would be the only album featuring Max Cloutier and Jessy Bergy. 1 2 "Role Model Clothing". SimplePlan.cz. Retrieved November 5, 2017. 1 2 "Biography - Chuck Comeau » Simple Plan Brasil". Simpleplan.com.br. Retrieved 2016-06-14. 1 2 3 4 5 "Chuck Comeau's Biography". Simpleplanrock.forumfreek.com. 2009-02-13. Retrieved 2016-06-14.